The figure illustrates the generation of fancy 4 dimensional spin-resolved scanning tunneling microscopy images. The z-position of a spin-polarized tip (imaged as grey scale) as a function of its lateral position (x,y) on the sample surface is recorded on one channel of the data acquisition system. This channel is called topograph. The spin-resolved differential conductance dI / dV coming from a Lock-In amplifier is measured in parallel on a second channel and imaged in color. Then, a standard raytracing program is used to render the topograph (3D) and put the forth dimension of the spin-resolved dI / dV signal as a color texture. 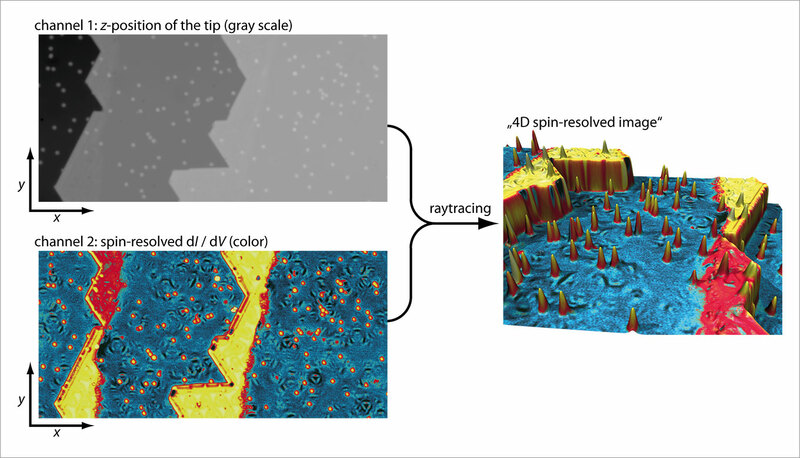 The resulting 4D spin-resolved image shows the two different out-of plane magnetized domains (red and yellow) of the monolayer stripes of cobalt attached to the step edges of the (111) planes of the platinum substrate (blue). The color on the individual cobalt atoms adsorbed on the platinum terraces (yellow hillocks) as a function of an applied magnetic field can be used to measure their magnetization curves (single-atom magnetometry).